The next day we were full-on road warriors, putting as much distance between us and Monterrey as possible. 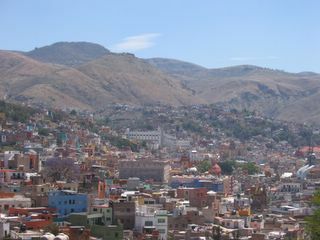 Our destination was the touristy old mining city of Guanajuato, in the central highlands northwest of Mexico City. With Rob’s crafty navigation, we enjoyed many of the toll roads without enjoying all of the tolls. 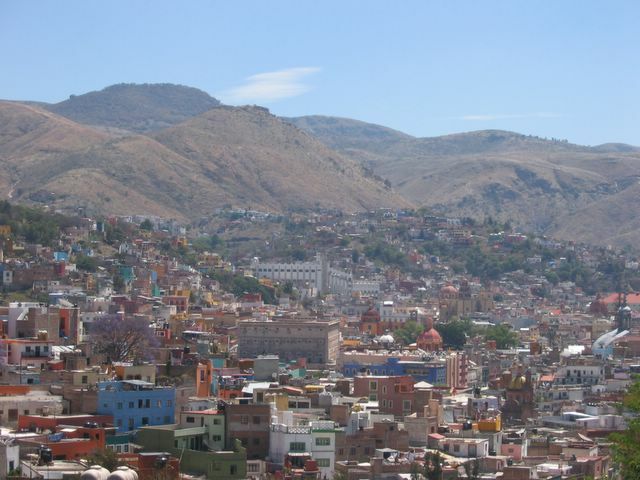 We made it to Guanajuato shortly before dusk and were quite pleased with ourselves – until we saw the traffic jam that was Guanajuato. The town is a maze of one-way streets and tunnels carved out of a labyrinth of impossibly steep hills – and it appeared that half the country had decided to vacation there this week. As it turns out, we entered Mexico at the beginning of “Semana Santa” which literally means “holy week.” It’s a deeply religious week leading up to Easter, celebrated all over Latin America, with many towns organizing elaborate processions and plays. But it’s also a bit like Spring Break for the entire country, since almost all companies and schools shut down for the week. Initially we thought this would be great since we like to party, but before long we realized that prices were doubled and hotels and streets were packed. 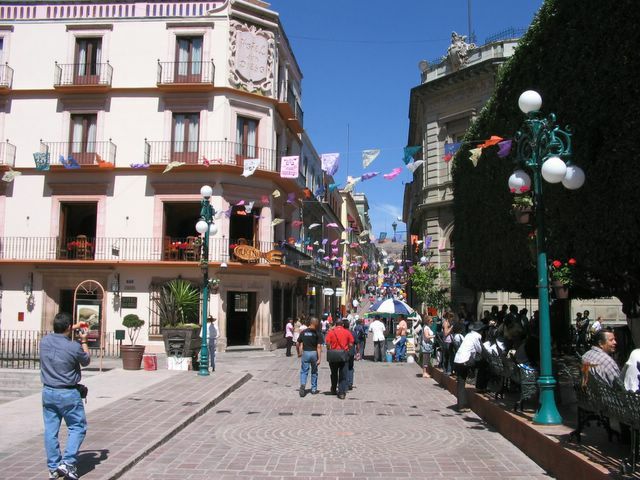 We ended up paying way too much for a hotel room in Guanajuato this night, our 2nd night in Mexico, and the next morning we were determined to find a better deal. We tried a place near the city center, and sure enough success! (Or so we thought – more on that later). Then we were free to enjoy the city. The People’s Guide to Mexico (an essential Mexico book if you’re going anywhere outside of the resorts) advises against going to the Museo de Momias (mummy museum) “unless you’re a hard-core horror fan.” So, of course, that was our first stop. 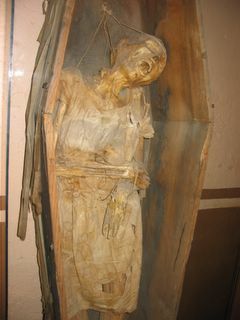 The museum displays some of the town’s former residents in their grotesquely mummified versions, as well as boasting baby mummies, the world’s smallest mummy, a pregnant mummy, and, apparently, an epileptic mummy. Now if you’ve ever seen a “mummy movie”, it couldn’t possibly prepare you for seeing the real thing – truly grotesque! 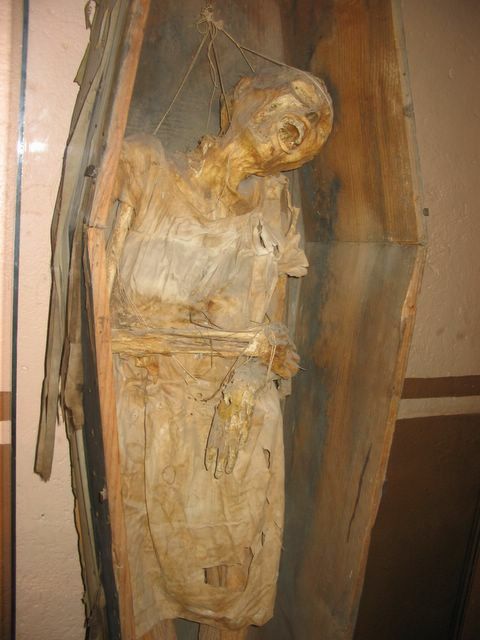 The mummies were first disinterred in 1865 when the residents needed to make room in the local cemetery, but instead of finding skeletons, the officials found mummies, and, realizing the Mexican culture’s fascination with death, decided to make money off of them. Our guide book claims the soil’s high mineral content caused mummification but our museum guide assured us that the residents were not buried in the soil but in crypts in the walls. We’re not sure how the mummification process takes place; all we know is that if one comes after you, make sure to sever its spinal cord. We left the mummy museum feeling a bit queasy, so we decided it was time for some beauty, and found our way to the Museo de Diego Rivera. Diego Rivera is Mexico’s most famous muralist and the two-time husband of Frida Kahlo, an even more famous Mexican painter. Rivera was born here in Guanajuato, however the conservative town shunned their native son for years due to the fact that he was a pinko commie. The museum’s paintings included a series he did in the early 1930’s that resembled Mayan hieroglyphs and nudes of several women, including one of Frida. We also had the luck of catching the “Diego y Frida” photography exhibit that was at the museum for March and April. 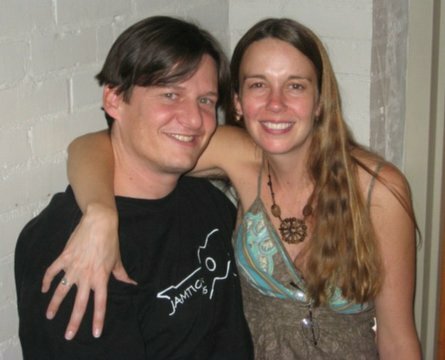 Most of the photos of the eccentric couple showed Frida looking austere and beautiful and Diego looking, well, rotund. One picture taken with another couple in San Francisco shows the men seated on chairs and the women seated on their laps – except that the wives swapped husbands. The photo was interesting in that you could see a gleam in Diego’s eye that hinted at his reputation as a womanizer. After walking around the hilly town, seeing its gorgeous theatres, plazas, and museums, we retired for a siesta, after which we walked Kina and had a late lunch. We came back to the hotel around 5:00 at which time, one of the women there informed us that we were no longer allowed to bring the dog in. Now, keep in mind that we had asked two different people, ostensibly in charge, at two different times if it was okay to bring Kina in the room. Both times, the reply was “no problema.” This was an unfortunate turn of events because there was no way we would find another reasonably priced hotel room that would allow Kina this late in the day. The woman got an earful from us, and it was the perfect time for Rob to learn the Spanish verb joder (to screw over). We lit out of town, thankful we hadn’t ever given them any money (even though we’d supposedly checked in hours before), and thankful to escape the crowds and traffic nightmare of Guanajuato. We ended up staying in Silao, a smaller town a half hour away, where we paid half the price for a hotel room, enjoyed the town’s Wednesday evening Semana Santa procession (a blind-folded Christ being led to the cross), ate fresh strawberries in the town square, and drank cheap beer in a seedy bar (which incidentally had the worst bathroom Rob has ever seen anywhere!). 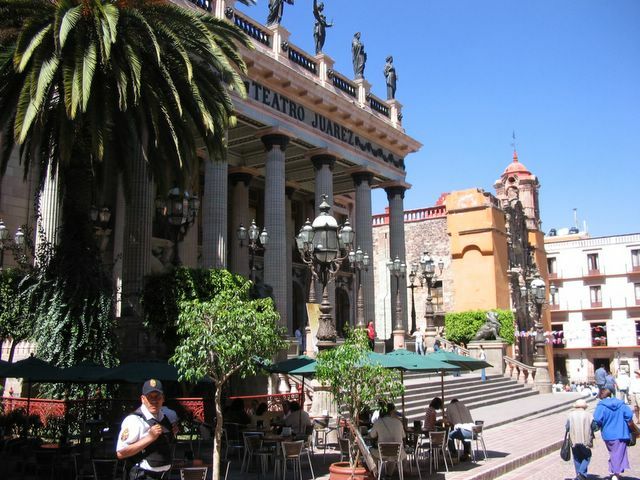 So, in the end, we think the lame hotel folks in Guanajuato are the ones who were jodido.